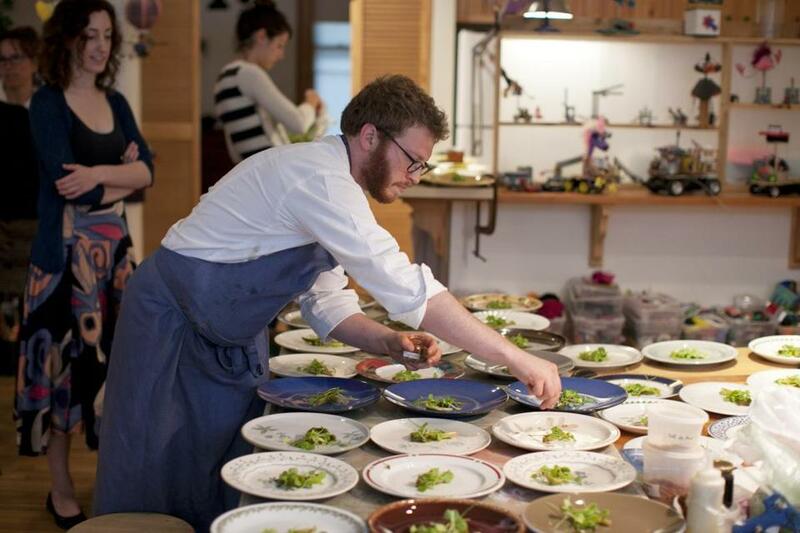 At Gallery 263, guest chef Joshua Lewin (pictured) of Beacon Hill Bistro finishes the cinnamon-scented lily white shoots and miner’s lettuce, then dribbles elderberry dye into the wild watercress soup. CAMBRIDGE — A tangle of bright green chickweed or a handful of miner’s lettuce is all it takes to convince city dwellers to rethink the salad course. Add a few other wild finds, such as lily shoots, elderberries, juniper, sumac, beach rose, knot weed, and fresh, first-of-the-season pullet eggs, and you have a foraged banquet that might be Thoreau- approved. On a recent weeknight, Gallery 263 propped open its doors and invited patrons and guests to participate in A Wild City Table, its third annual foraged banquet fund-raiser. This year’s guest chef, Joshua Lewin of Beacon Hill Bistro, combined the training and finesse of a seasoned pro with the natural know-how of a sensible forager. He created a seven-course vegetarian menu using greens, berries, herbs, spices, mushrooms, flowers, and fruit, all from local sources. Foods came from various places within the state, from the waters off the Cape to rural areas in Western Mass. Even the saltwater used to boil freshly made pasta was drawn (and purified) from the Atlantic. Only a few ingredients — buttermilk, goat’s milk, and pullet eggs — were procured from local farms. The quaint white and yellow Gallery 263 sits on a quiet Central Square corner. Transformed into a pop-up dinner, the gallery was a mix of mismatched tables and chairs and hodgepodge linens and glassware. Art from the Annual Artist Member’s Show hung on the walls and each table was topped with a small vase or up-cycled Mason jar of freshly picked pansies. The foraged foods dinner is an annual fund-raiser. Throughout the year, the gallery displays collections showcasing community art, as well as artists’ work from around the nation, and serves as a community space for Cambridge residents, hosting yoga sessions and small theater productions and musical ensembles, many written and produced by locals. 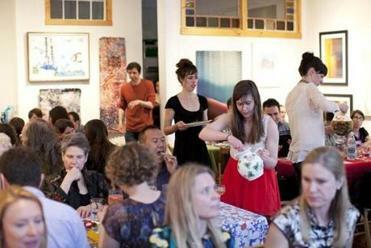 The annual foraged dinner is another example of the gallery’s community-centered and hyper-local philosophy. The evening began with pitchers of white sangria muddled with fresh, local fruit, and baskets of rustic brown bread. Since the gallery has no kitchen, most of the food was prepped off-site and assembled in a patron’s apartment a few doors down. Lewin and his impromptu staff — gallery employees and devoted patrons — streamlined the dinner service by alternating between types of courses and minimizing cleanup by providing each diner with a single plate and one bowl. On a table spread with various sets of donated china, Lewin carefully tousled wild greens into little nests and sprinkled edible redbud flowers on every plate. Dinner started with cold dishes: cinnamon-scented lily white shoots and miner’s lettuce, wild watercress soup with elderberry dye, and a chickweed salad topped with a runny pullet egg and creamy buttermilk and juniper berry vinaigrette. The only hot course was freshly made pasta tossed with wild mushrooms and nettles. Several dessert options followed, including a sweet and savory sherbet made with whey, a goat’s milk panna cotta flavored with sumac and beach rose, and a dainty shortbread-like cookie square topped with sweet and tart knotweed (a botanical relative of rhubarb). Working alongside Lewin was gallery cofounder David Craft, the author of two guidebooks on urban foraging. Craft said this rainy time of the year is a “good time to forage,” and when he isn’t planning events at the gallery, he leads foraging tours in the Cambridge and Brookline area and helps locavore chefs find ingredients for their restaurants. Craft was careful not to disclose his favorite foraging spots, which has more to do with ecosystem management than industry secrets. Foraging is experiencing a fashionable renaissance, so the idea of eating an entire meal found on the land and at sea isn’t as unusual as it sounds. 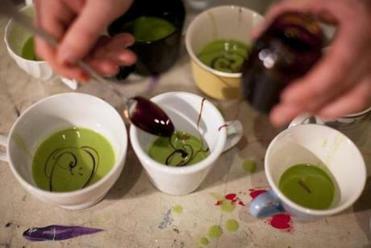 At a small gallery in Cambridge, foraging is another excuse to bring the community together. Katherine Hysmith can be reached at kchysmith@gmail.com.